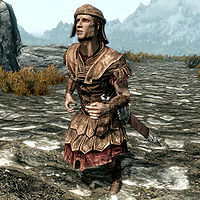 The Imperial Courier can be encountered on a few occasions within Skyrim. If you did not receive a suggestion from Hadvar to join the Imperial Legion after completing Unbound, and haven't yet joined either side in the civil war, it's possible to encounter the Imperial Courier randomly. He can also be encountered during A False Front, when you must retrieve their documents for Galmar Stone-Fist if you've joined the Stormcloaks. Attacking him outside the related quest is considered a crime. He wears a full set of Imperial Light Armor and is armed with an Imperial sword, supplemented by an Imperial bow with thirteen steel arrows. He also carries a backup steel dagger and a belted tunic. This page was last modified on 12 January 2015, at 14:07.